These feared yet magnificent predators inhabit all of the world’s oceans, but nowhere else are there so many of them, so close to shore and so readily observed as here, near the southern-most tip of Africa. A number of islands supporting huge seal and pelagic bird colonies, and waters rich in fish, undoubtedly are the major factors in attracting and maintaining such large numbers of great white sharks throughout the year. The water is “chummed” with a liquid mix of fish ingredients; designed to attract but not to feed the sharks. For the dive all equipment, including all size wetsuits are provided. If you bring your own pair of goggles, you can be sure of a perfect fit. The diving cages are designed to float and are made of a sturdy galvanized steel mesh protruding 1 metre above the water’s surface to allow the divers to come up at any time. A lid prevents sharks from slipping in at the top. All diving equipment is well maintained and regularly inspected by the dive-master. Warm clothes, bathing costumes, a hat and sunscreen, plus photographic equipment should be part of your personal effects. Having these items packed in a small, easily manageable bag will save space and make them readily accessible. A breakfast and a light lunch are provided and refreshments are available throughout. The best time to view sharks here is between April and October when these stealthy hunters are primarily focussed on feeding on the baby seals and fish around Dyer Island. 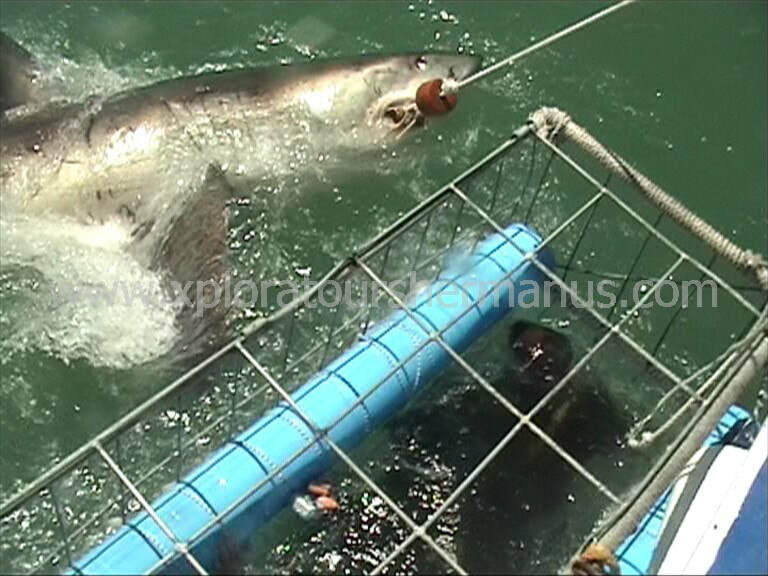 This behaviour changes quite significantly during the summer months from November to March, when white sharks here seem to be less interested in food and are not that readily attracted to the bait. Latest research indicates that their suppression of appetite at this time would prevent both serious injury during mating and cannibalising on their off-spring after birth. 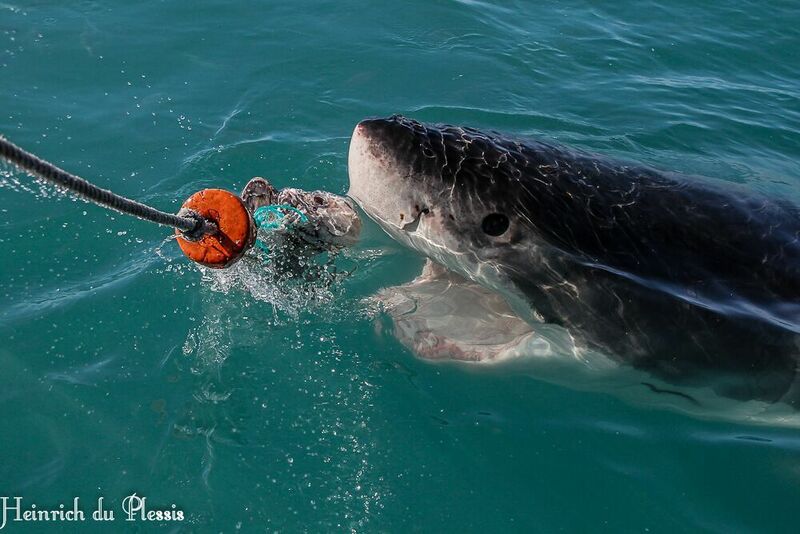 Still, even during summer great white sharks are encountered 95% of the time and many superb days are spent at sea. 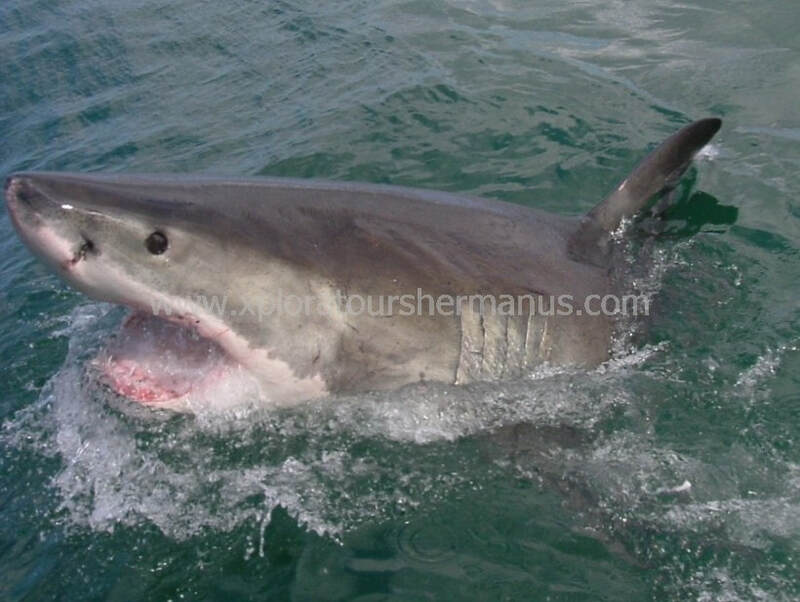 On a good day upwards of a dozen different great white sharks ranging between 1,5 and 4,5 meters may be encountered, with heaps of action around the boat. 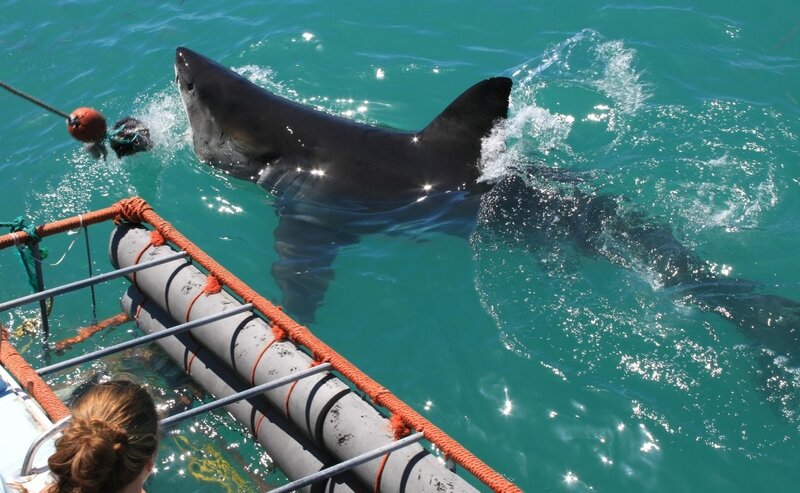 There are only 8 boats legally allowed to operate Great White Shark cage diving and surface viewing trips and we deal with them all. The size of great white shark remains a matter of speculation, with females being larger and reputedly reaching 7 meters in length. It would however appear more realistic to suggest a maximum of around 6 meters, with a minimum of 1,2 meters at birth. Its weight can top 2 metric tons. 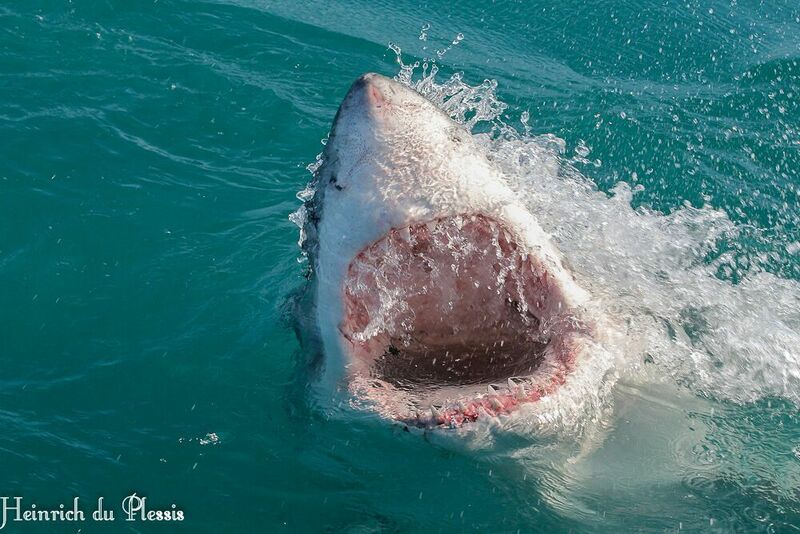 Like all sharks, great white sharks have no bones and their skeletons are composed of cartilage. It is therefore that the only fossil remains of sharks are their teeth. They are heavy-bodied with a triangular dorsal and a crescentic caudal (tail) fin, large triangular teeth and 5 gill slits. Their colour can vary from almost black to light grey dorsally (on top), with an almost white ventral surface (underside). 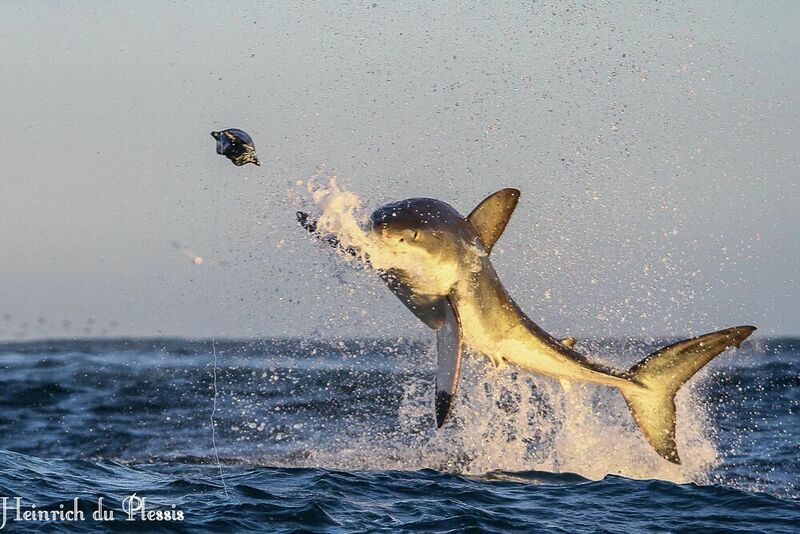 Great white sharks are apex predators, i.e. they are at the top of the food chain and have no natural enemies other than man. They consume a large variety of prey, which primarily consists of marine vertebrates and in particular marine mammals, bony and cartilaginous fish. All species of seals including elephant seals appear to be on the top of the menu, and due to their comparatively large size and relatively stationary habitats make for very economic prey. The fish component of great white sharks must not be underestimated though, with anything from sardines to blue fin tuna being ingested. Cetaceans and especially dolphins are a common prey-item and dead whales are readily scavenged upon. However, it seems evident that most seabirds and in particular penguins are often rejected and are consequently seldom found in the stomachs of great white shark carcasses. Their propensity to scavenge results in the regular entrapment and killing by commercial fishermen and trophy hunters. Great white sharks also appear to be capable of significant social behaviour, which dispels the notion of it being a mindless killer. Observations further indicate that with their highly developed olfactory and electrical senses, and with good eyesight they are very likely to differentiate adequately between different types of prey and non-prey species. The reproductive behaviour of great white sharks remains somewhat of a mystery as neither mating nor upping has been scientifically recorded. Judging by their feeding habits during the summer months, together with the presence of mostly large adults and neonates (new-borns), it would make sense that this is the time they mate and give birth to their young. A very high incidence of what are clearly fresh, crescent shaped bite marks on the underside, flanks and pectoral fins of particularly females, would further be indicative of males grasping females during copulation. 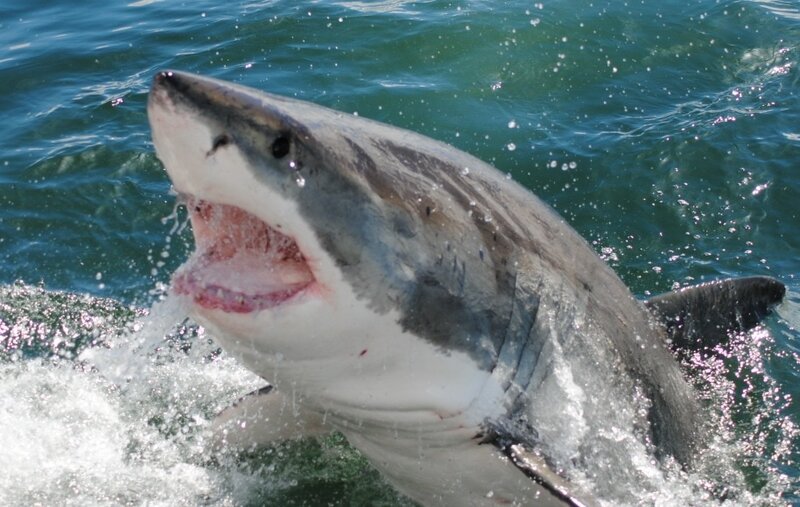 Furthermore, the presence of great white sharks near some seal colonies declines drastically during summer, which would only make sense if feeding were somewhat inhibited. They appear closer to the beaches and are far less likely to react to “chum” or bait. This apparent disinterest in food may well be a mechanism by which serious injuries during mating and cannibalizing on their offspring after birth may be prevented. The shallow waters in close proximity to beaches, with very little in the way of prey appear to be preferred, and are likely to be much more conducive to mating than the deeper hunting grounds. Verified litter-sizes range from 5 to 10 near term foetuses and the size at birth is estimated to be between 1,2 to 1,5 m. The majority of females appear to mature at between 4,5 and 5 m, males at between 3,5 and 3,6 m, with an approximate age of between 10 to 12 years. Gestation periods are probably quite long, possibly around a year, and it is likely that females only reproduce biennially. Great white sharks are a cosmopolitan species which frequent mostly temperate seas (13 to 20°C), but will occasionally also penetrate tropical and arctic waters. They are found at the surface to a depth of 200 m, from the surfline to the deep sea and often occur in large numbers near island and rocky headlands inhabited by seals. Many individuals have been identified at the same site during the same time of year, and while some will remain resident for a while, many are just short-term nomads. They clearly do not only inhabit continental and insular shelf habitats, but readily undertake crossings of the great ocean basins. 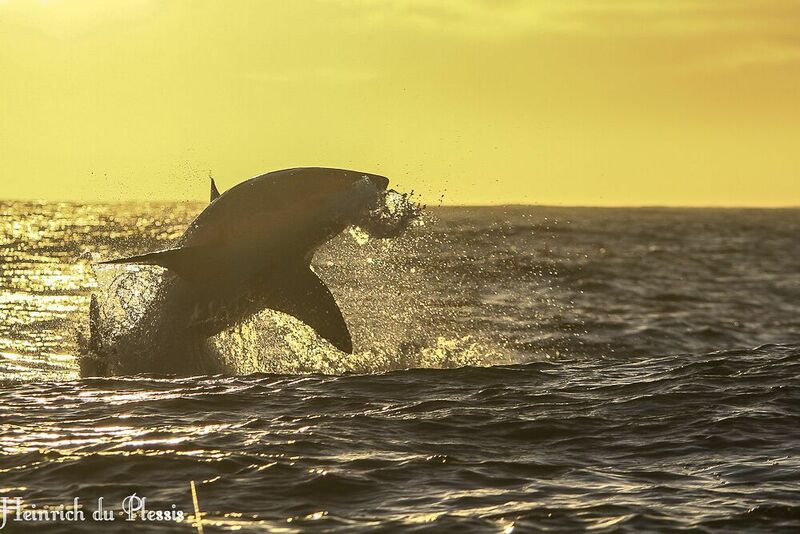 The spatial behaviour of great white sharks is still very poorly understood and will remain enigmatic until substantially more research may offer some explanations as to the forces, which influence their distribution. It is certainly safe to say that man has killed (and heavily exploited) many more great white sharks than vice versa, and their numbers, even though protected in some parts of the world, will probably never recover to what they once were. With the advent of neoprene wetsuits and with the ever-increasing leisure time exploits of man, many more people frequent our coastal waters for longer periods of time, which will logically result in more shark-man encounters. 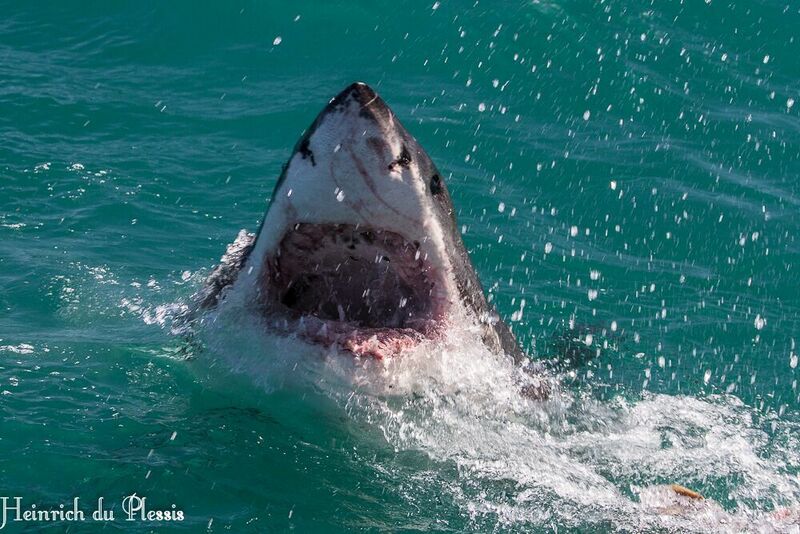 Add to this the apparent fact that great white shark populations show a tendency to move closer to beaches during summer, it is little wonder that they will be perceived as a serious threat by the generally uninformed public. It has however been observed underwater that they readily distinguish between humans and prey-animals, and that “shark attacks” are far less likely to be due to mistaken identity, than to some social interaction. Around 80% of attacks on man are grab-and-release and it is suggested that such unfortunate incidents are more likely the result of “mouthing” (feeling) based on perceived invasion of space, tactile investigation or play, than being motivated by feeding. 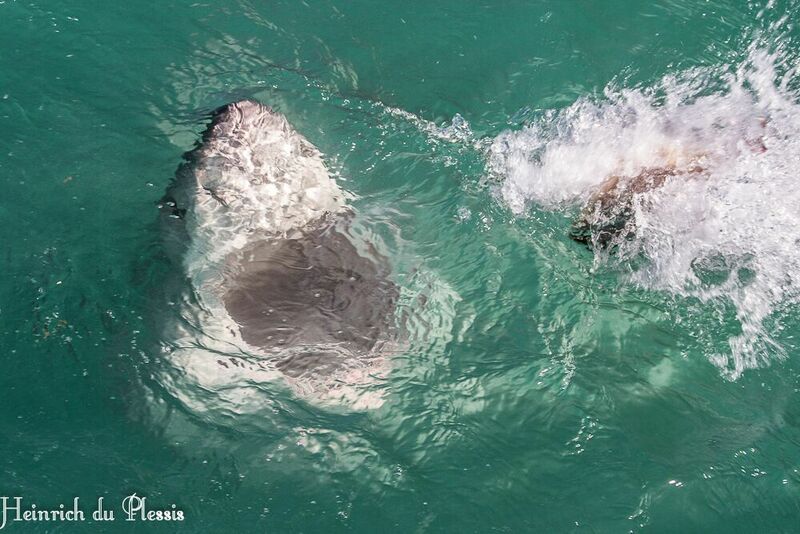 Great white sharks interact socially by low-intensity biting, particularly during the summer months and most probably associated primarily with mating. 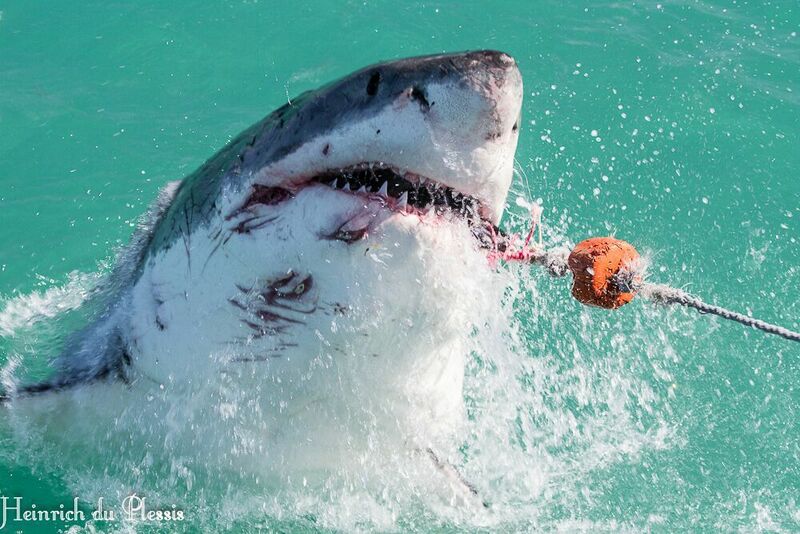 A better understanding of how these magnificent creatures interact with their own and other non-prey species will hopefully contribute in finding means to protect humans better from ill-fated great white shark encounters and great white sharks from vengeful human endeavour.